It is easy to feel lost in a new city or far away from home. ICF meets in weekly and bi-weekly Life Groups. Life Groups are a place of community, a smaller gathering than our Sunday services. A Life Group is a place to really get to know others in Delft. Most groups share a meal together, discuss a passage or theme from the Bible, and share practical help. Life Groups help you to understand and live out Jesus’ good news in your daily life. ICF Life Groups meet on various days and times in the week. Fill in the form to find out more, and visit a Life Group to experience it for yourself. Every other Sunday (once per two weeks) we come together in the house of one of our members for dinner, bible study and prayer. A great opportunity to get to know Christians from all over the world in a private setting, to learn from the Bible and to pray together. On Monday morning we have a Women’s group at Taste. Whether you are a regular visitor of ICF or not, you are very welcome to join and participate! Every Tuesday evening at 20:00, we come together at one of our members home for either a prayer meeting or a Bible study. We alternate between these two kinds of gathering. Whether you are a regular visitor of ICF or not, you are very welcome to join and participate! Every other Wednesday (once per two weeks) we come together in the house of one of our members for dinner, bible study and prayer. A great opportunity to get to know Christians from all over the world in a private setting, to learn from the Bible and to pray together. Every Thursday evening at 20:00, we come together at one of our members home for either a prayer meeting or a Bible study. We alternate between these two kinds of gathering. Whether you are a regular visitor of ICF or not, you are very welcome to join and participate! Every other Friday (once per two weeks) we come together in the house of one of our members for dinner, bible study and prayer. A great opportunity to get to know Christians from all over the world in a private setting, to learn from the Bible and to pray together. The men and women of the congregation have a chance to meet separately about once per month. The men typically meet for breakfasts on Sunday mornings at one of the cafes or restaurants in Delft. The ladies’ evenings are more varied in nature and typically happen in the evening. They happen in the home of one of the ICF members, and they can include discussion, cooking, or or beauty care. Learn more about what drives us! ICF Delft would be glad to introduce you to what the Christian faith is all about. Here you can find information about recent, ongoing, and coming courses on Christianity. Alpha is a series of sessions exploring the Christian faith. Each talk looks at a different question and is designed to create conversation. Alpha is run all around the globe, and everyone’s welcome. 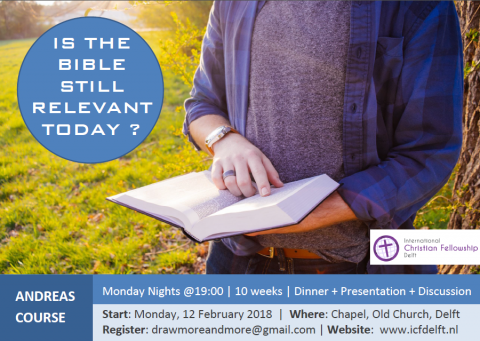 Come join us for free dinners and discussions about Christianity! Join the new Andreas Course! If you want to find answers to honest life questions, the Andreas course might help you. It implicates learning and discussing in an open and intercultural setting, while sharing a meal with interesting people. Discipleship is a long life process. In this course you will find the essentials that will help you to follow Jesus, to grow in Him and to share the light of the Gospel with others.